Asafety harnessis a form ofprotective equipmentdesigned to protect a person, animal, or object frominjuryor damage. The harness is an attachment between a stationary and non-stationary object and is usually fabricated fromrope,cableorwebbingand locking hardware.Some safety harnesses are used in combination with ashock absorber, which is used to regulatedecelerationwhen the end of the rope is reached. One example would bebungee jumping.Safety Harness for protection against falls from heights in industrial and construction activities are covered by design performance standards issued by ANSI (American National Standards Institute) in the United States and by CSA (Canadian Standards Association) in Canada.that employers provide fall protection for construction workers on a walking or working surface with an unprotected edge that is 6 feet or more above a lower level. Fall protection approved by OSHA includes guardrails, safety net systems, and personal fall arrest systems (i.e. safety harnesses). Employers are permitted to use any or all of the three prescribed fall protection systems in most instances, not specifically safety harnesses as Gilbane recommends. The rule covers a number of areas and activities where fall protection is required and the fall protection systems allowed. For example, protecting workers from falls into holes, such as skylights, another acceptable means of fall protection is installing a cover over the opening. When working on the face of reinforcing steel or formwork above 6 feet, employees can use a personal fall arrest system, safety net, or positioning device system. Over-the-shoulder restraints used onroller coaster trains. A seat with a full body harness such as used byfighter pilots. Fall Basic fall Arresting Harnesses shall be designed to Comfort Adjustable shoulder, thigh and chest straps with dual color. Support the body during and after the arrest of a fall and have one D-ring for fall arrest attachment affixed to both shoulder straps at back or front. All metal components shall be solid or forged in such a manner that the joints are not visible and the joined part of the metal does not impair the strength or quality. Universal Fit. Value for money. 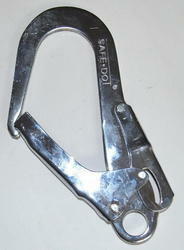 Single Normal Hook Half Body Safety Belt. Long Rope. Proper Stitched. For Industrial/Construction/Sports/Adventure Purposes. A rope is a group of yarns, plies, fibers or strands that are twisted or braided together into a larger and stronger form. Ropes have tensile strength and so can be used for dragging and lifting, but are too flexible to provide compressive strength. As a result, they cannot be used for pushing or similar compressive applications. Rope is thicker and stronger than similarly constructed cord, string, and twine. Fiber rope is made from fiber, whereas wire rope is made from wire. 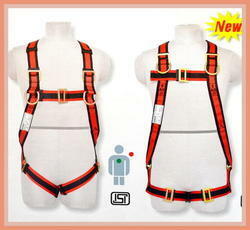 we have designed Full Body Harness, for our esteemed customers. 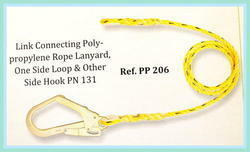 These products are offered with PP double lanyard and hook, resulting in the optimum body protection of the wearer. ISI mark, our offered range is widely cherished among our clientele and is offered at market leading prices. Now Companies have also started adopting increased safety measures since it has become mandatory to follow safety protocols. Audits for Fall Protection Belt take place to check their conformance to safety and quality standards set by government and testing bodies. Our Industrial Fall Protection Belt is compact and light weight so that it occupies less space and becomes easy to transport. Safety Helmet with Rechargeable Torch We are the leading manufacturer and supplier of Safety Helmet With Rechargeable Torch. 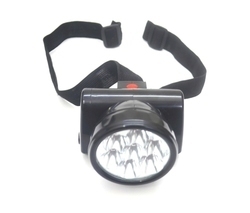 Our range of Rechargeable Torches is light in weight and attractive in designs. These come well tested on defined parameters so as to provide for optimum functional support in given application areas. Full body harness is a body holding device used to protect workers from falls by distributing the force of the fall over a large area of the body, ensuring that the subject of the fall remains suspended in an upright position after the fall has occurred. It is designed to minimize the risk of injuries caused by suspension. My trailer came with simple s-hook style chains. I wanted to have a more confident connection. These fit the bill. I cut off the old hooks and inserted these. 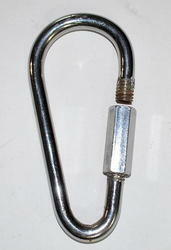 It's very convenient that you can attach these to chains without opening any links. Brings a couple of them which is great! They feel pretty solid in the hand and don't feel like they might bend or break on low to medium pressure. However, they do say not to use these for climbing and since it says it on the actual product. I would not recommend it. But overall is still pretty great to hold keys and other things. I got the blue which looks really nice and stands out a lot.